The eyes tell you the story don't they? I have finished my latest painting of "The Grey Mare" - funny everyone who sees it says it looks like Ebony (even though she was black and looked nothing like this) I get it though - it's in the eye and her spirit is coming through my work I believe - whatever the case I am feeling good and purposeful about this new direction. I finished stitching this sweet heart yesterdy as an homage to my mare Ebony and my passionate love for horses. The stitching is from Pam Garrison's stitching line and the rest was influenced by the class I took at French General. My beloved soulmate Ebony passed. I never thought I would get over my grief. It was through my art that I did. I still miss her each and every day but now it is more sweet than bitter. A friend told me while I was grieving that one day Ebony's spirit would come to rest inside of me. That one day I will feel her strength and love in every breath. Now indeed I do. I created this remembrance book for my darling sweet girl Ebony who I lost this past May after 18 yrs in Judy Wilkenfeld's class Just in Case at Art and Soul in Portland. First, a little about Judy and why I took 3 days with her. She is incredibly generous of spirit - sharing all her techniques and thoughts and ideas freely, she is encouraging and supportive, and she herself puts all the meaning and nuance into her own work which is what drove me. I was very happy about how the book turned out and more than anything it really was a process in my grieving. I love this book and more than anything it is a part of her that I will always cherish. .... without ... a horse in my keeping, I should feel I had lost contact with the earth. I should be as concerned as a Buddhist monk having lost contact with Nirvana. This was my dear girl's last day. She still was beautiful til the very end of her 28 yrs on this earth. I miss you every day sweet one - every day. Farewell my sweet sweet girl. She was my best friend for 19 years without fail she was there for me with unconditional love, a nicker, a soft nose to kiss, and a sure and steady presence. Ebony turned 28 on May 10 and on May 12 she moved on to a place that I believe has endless green pastures, no pain, and an endless supply of carrots. She was a constant strength in my life and I cannot imagine it without her. I will miss her every day without question. My husband Mark bought her for me on our first Christmas together. There has not been too many days since then that I haven't seen her. Yesterday, after weeks of trying to get her well and pain free - I let her go. It was the hardest goodbye I have ever made and my heart feels like there is a huge hole in it. I know I did the right thing, the unselfish thing, the kind thing - I let her go when she had a perfect morning - she went out to graze in her favorite pasture with he buddy Spot eating grass in the sunshine, I gave her a bag of carrots for them to share and I told her how much I loved her and I thanked her for all she had given me. And I said goodbye and that I would see her on the other side when my time comes. My heart is broken and I miss you beyond measure. 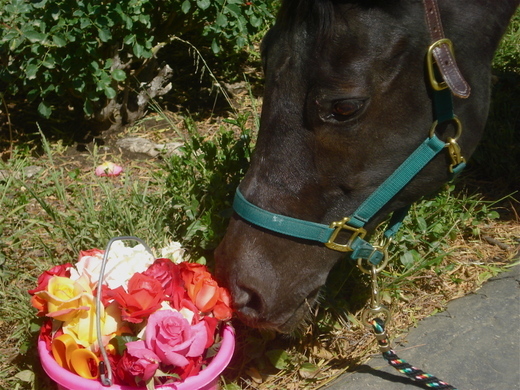 I love you my sweet, sweet girl - my rose smelling horse.